A Master and Doctoral Graduate from the Sibelius Academy of The Uniarts (University of the Arts) Helsinki. Jari started his performing career in Finland in late seventies playing with big bands and leading his own small groups. He recorded his first album as a leader in 1984. In 1991 he was one of the semifinalists at the Thelonius Monk Saxophone Competition in USA. Perkiomaki's performing career covers all continents with such names as Mike Nock, Anders Jormin, Tim Hagans, Randy Brecker, Phil Markowitz, Reggie Workman, Andrew Cyrille, James Moody, Jonathan Kreisberg and Don Preston. 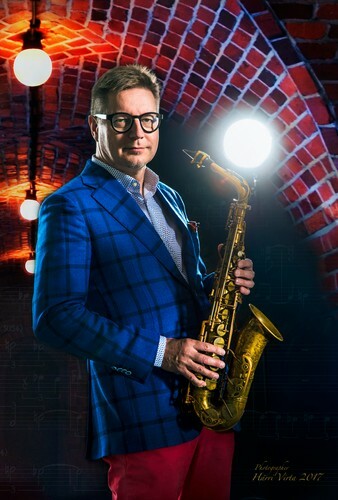 Having recorded mainly on alto sax as his main instrument, 2016 Jari released the album Organic Baritone Quartet, playing the baritone sax with Hammond Organ trio. Since 2012 Perkiömäki is the chairman of of the IASJ, The International Association of Schools of Jazz, with artistic director David Liebman. Currently Jari works as the Rector of the Uniarts Helsinki with over 2000 students in Music, Theatre, Dance and Fine Arts.